Blends for a new pipe smoker? Or burley stuff . I'm no fan of HEARTH and home , GLP and C&D burley blends but many think they are good . I'd second what's been said of MacBaren Golden Extra and symphony , though Wessex Burley Slice and Solani are kinda where it's at for a burley flavor , imho . Thanks! I think some aromatics will be too much, so I just want to dip my toes at the shallow end first and see. I definitely agree that a mildly flavoured/sweetend black cavendish would probably suit me, so I want to try something like that. 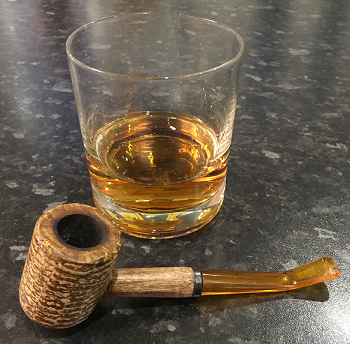 I think my idea of what constituted a sweet aromatic was quite skewed from what a seasoned pipe smoker (particularly one form the US) would think. It seems that St Bruno and other OTC, mild lakeland blends that were popular in the UK would be considered by many as quite sweet and aromatic. But to me St Bruno tastes less sweet and aromatic than I imaged it would based on the room note I remember from my childhood. So I think I need to look for something quite a bit sweeter and more aromatic than I first thought but probably not that much sweeter and more aromatic than St Bruno or Rich Dark Flake. It's tricky to say though as this is all very new territory for me. I'm enjoying the journey though. It's very interesting to sample all these different blends. I'm learning a lot. I'll definitely be sticking to small samples for a while to keep it fun. I reckon I could have got well over 30 mins out of my bowl as I slightly over filled it by accident. Just curious Dave, what pipe are you smoking out of? What size chamber does it have? It's THIS one. I chose that one as it seemed like an average size to get started with. To be honest based on the amount of time I'm likely to have for smoking a pipe I think I could get away with something with a smaller bowl. I only need something that will last me about 10 minutes at the moment. Great choice! You can't do much better than a Legend for your first pipe. 30 minutes, even as small as the Legend is, is maybe a tad bit short for a full bowl unless what you are smoking is really dry or a fast burner. This is why I asked which pipe you had, just to kind of judge your pace. You might want to give "breath smoking" a try. It's a trendy thing to talk about as "a thing", and if you are naturally a clencher this might be second nature. I have found this video from Alan Kerslake(RIP) helped me a little and has helped a few other newbies I've sent it to. It seems absurdly deliberate when you first start doing it, but it doesn't take long for it to become automatic. Also, keep in mind that you can always pack the pipe half full if you want a shorter smoke.. there are no rules so do what is most enjoyable! Thanks, the first few blends I tried I did just pack a half bowl but I was a but more optimistic about the last couple, so I thought I'd go for a full bowl as I had a bit more time today. It's good to know that I'm getting closer to the correct burn rate. I think with this size bowl I probably would usually just half pack. So I guess it would make sense for me to look for a pipe with a smaller bowl eventually. The Legend will do me for now though. It's amazing value. The breath smoking technique looks interesting. I'm going to have to watch that video a few more times I think. I have noticed that I do accidentally breath back into the pipe on occasion when clenching and exhaling. I assumed this was a bad thing but I guess when done correctly it can be beneficial. The only problem I found when accidentally doing this is that some of the top ash layer would puff out the bowl in an amateurish fashion. So I guess you have to exhale very gently into he pipe to prevent this. Thanks, It looks like it is available in the UK, so I'll add it to my wish list. First up from my latest selection was Gawith Hoggarth Conniston Cut Plug. The tin note on this is fantastic. Lots of deep, earthy, leathery notes with some lighter fruity and floral top notes. I definitely got more sweetness from this blend, the aroma was very pleasant and I got a very nostalgic feel from the overall experience. My only negative point was that I got quite a lot of bitterness towards the bottom of the bowl but that could be due to a number of reasons, so I'm going to ignore that this time round. I'll definitely be coming back to this one. Next up was Gawith Hoggarth American Whiskey.The tin note on this was is much milder than the Conniston and I wouldn't say it specifically smelled of Whiskey but it's very appealing. I found this smoked well, definitely a little milder than some of the other blends I've tried but with a nice complexity and a natural aromatic quality. This one has Black Cavendish in the blend and I enjoyed that in the Century Black Spice I tried last month. So that confirms to me that I like Black Cavendish. I think I'd go as far to say that this is my favourite blend so far. So I'll definitely be coming back to this one. Today I tried Mac Baren Cube (Silver). I don't know what the silver bit means but that's what it says, so there you go. This is a much sweeter, Danish style aromatic and is apparently very popular. The tin note is very sweet and fruity but with some underlying tobacco notes. It smoked quite well and was quite pleasant. I mainly got an aroma of fresh fruits and lighter tobacco notes with a little vanilla. I can see this working at a BBQ on a sunny day, kind of like a fruity, hoppy ale. Overall it was a little underwhelming, so I'll probably not get any more of this unless I decide to try blending it with something else to add more character. Judging from the tin note I think the Ennerdale may be a bit too floral for my taste but I'll see. Both the Jamaican and 1792 Flakes smell amazing. I look forward to trying all of them. Ennerdale is a trip . I'm not a big fan of the " soap " aromatics and I made a couple videos of the Ennerdale a couple years ago . A fresh bag had more " soap " , while a bag that was a few years old had less . Maybe it wears off some over time ( ? ) . It seemed to dissipate pretty quick after the light up , though it remained but not like at the beginning. If you happen upon some Warrior Plug , which I guess is out of production anymore ... man , you should snag it . It was one of the best Brit OCT ever , imho , if not the best . I've just noticed that I had the stem on my pipe upside down in that photo I posted. Not sure how I managed that. I've started to get a better understanding of where I was going wrong in a couple of areas. I think at the beginning I wasn't drying out my tobacco enough and I think this was causing a lot of the bitterness I was experiencing. I tested this out by attempting to smoke some Jamaican Flake with very little drying time. The bitterness was overwhelming after a couple of minutes. So I'll have to come back to that one and dry it properly. I also think I was packing my bowl too loosely and that was giving me and uneven burn. I'm having more success now. I then tried Ennerdale Mixture. The tin note on this is similar to Conniston Cut Plug but more floral. I found this a very pleasant smoke and very similar to Conniston Cut Plug but it actually seemed to have less complexity than Conniston. So I'd say Ennerdale is milder in general. I didn't find it to be overly floral or soapy. It just had a nice natural aromatic quality. So overall I think I preferred the Conniston but I'll have to try them back to back one day to make a closer comparison. Next I tried 1792 Flake. The tin note on this is fantastic. It's like Conniston but with more deep earthy, leathery tones and a subtle smokiness. I really enjoyed this, it smoked great. It had the most flavour of any blend I've tried but also had lots of lovely aroma. The nicotine hit was pretty powerful too. So it's definitely not a breakfast blend. This one's definitely going on my list. I've noticed that Gawith also do a plug version of 1792 called Cob Plug. It's supposed to be even more intense so I think I'll pickup a sample of that next time as I'm very intrigued to see what that's like. So that just leaves Jamaican Flake for me to test, this time drying it properly.